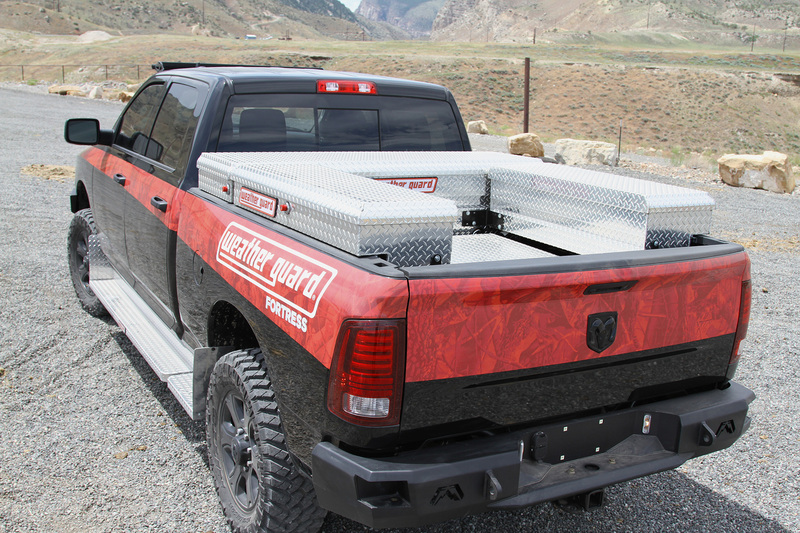 Weather Guard is one of the best (possibly the best) manufacturer of truck tool boxes. The company was founded back in 1960 in Crystal Lake, Illinois in just a small, single room shop. 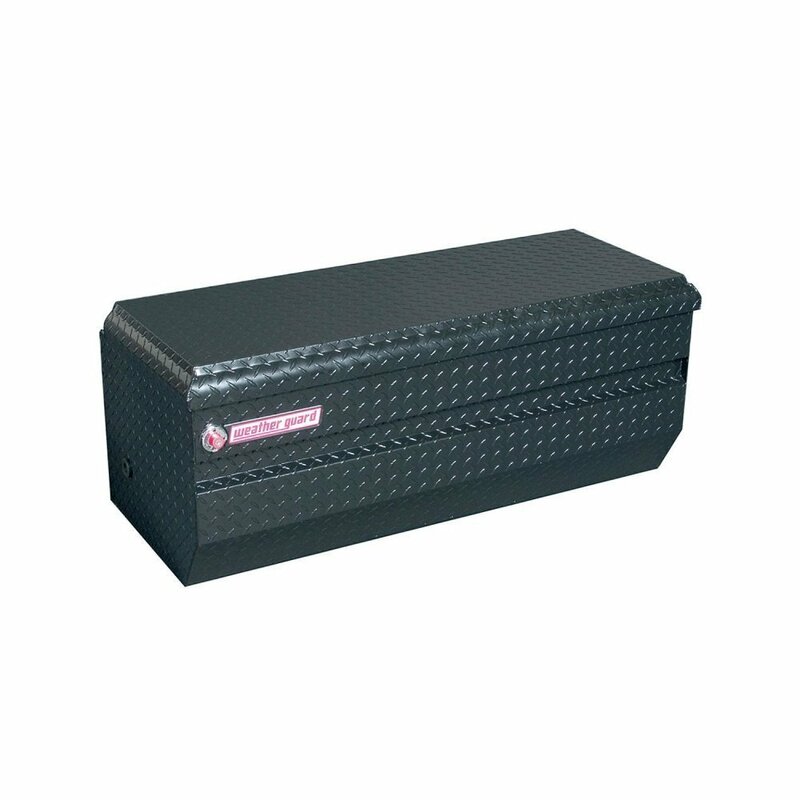 Now, a WeatherGuard tool boxes are almost synonymous with quality, security and professionalism. Owners absolutely love them and many won’t buy anything else. Forums like Cummins, DieselPlace and TractorByNet are riddled with posts of satisfied owners making their recommendations for those looking for a Weather Guard tool box. They may be a bit more expensive than some other brands, but you are getting what you pay for: quality materials, manufacturing and security. If you’re going to be storing thousands of dollars of tools, you want to protect them with the best storage solution available. There are several different models available, so we’ve done our research and put together our top 5 picks for you to choose from. Don’t have time to read every full review? Use this nifty comparison chart to make a quick, informed decision. Check out the full reviews of each model below if you want to read every last detail! The first of the WeatherGuard tool boxes we have on the list is their classic crossover style, single lid model. An included sliding tray helps you keep your smaller tools and materials organized. A removable parts bin improves the organization as well. A built in level-holder is mounted to the back wall of the chest, which can be used to store a level, keeping the glass gauges safe from breakage. There is also two stainless steel loops used for attachment points that can be used to secure your gear in your truck bed. Weather Guards are constructed from high quality aluminum. While other aluminum models may be thin and easy to dent, WeatherGuard’s are made from thick and sturdy aluminum. The rugged diamond plate design is strong, functional and looks great. The 71″ comes in two different finishes, black and metallic. The Armor-Tuf black powder coat has a sleek black shiny finish. It looks great and will match with most rigs. Or, you can keep it classic with the shiny, aluminum metallic look. Weather Guard coats the metallic boxes with an Armor-Tuf clear coat. Either way, even unfinished, aluminum is naturally rust-resistant and getting either coat style won’t increase your risk of rust, it’s just cosmetic. The WeatherGuard crossover features Extreme Protection locking system to prevent break-ins. Its retractable design is tamper-resistant which should discourage most thieves. The thickness and quality of the aluminum would make it very difficult to cut or torch through. The automotive style rotary latches close securely and allow for very easy opening of the lid. There are two shocks that help to lift the lid up to 90 degrees with barely any effort required. They’re protected behind a piece of steel unlike most other brands. There is a full weather seal that surrounds the lid, keeping out moisture, dust and dirt. Your tools will stay clean and dry even in heavy rain or other bad weather. 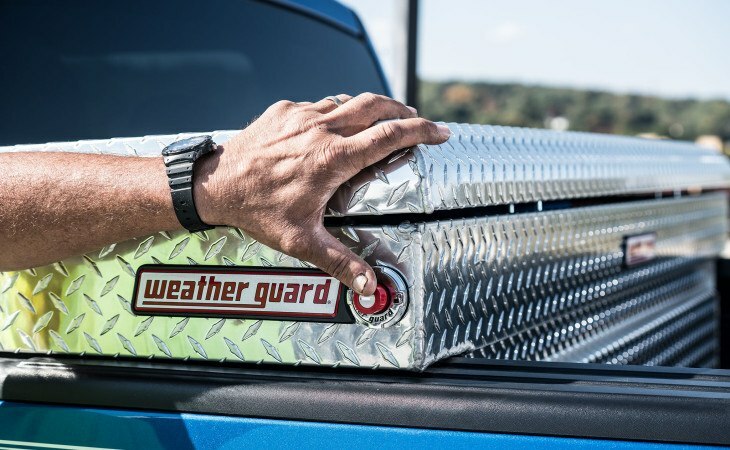 This WeatherGuard measures 71.5 inches in length, which fits almost all full sized trucks. It will take up 19.75 inches of space in your truck bed and is 18.5 inches high. We’ve got a mid sized version further down the list if you don’t have a full size. It lies across your bed rails and will hang down into the bed of your truck. Depending on the height of your bed rails, the tub may touch the bottom of the floor. Installing is similar to any other crossover style. Unlike simple J-hooks, some unique brackets are included that are heavy duty and far superior to most mounting hardware. 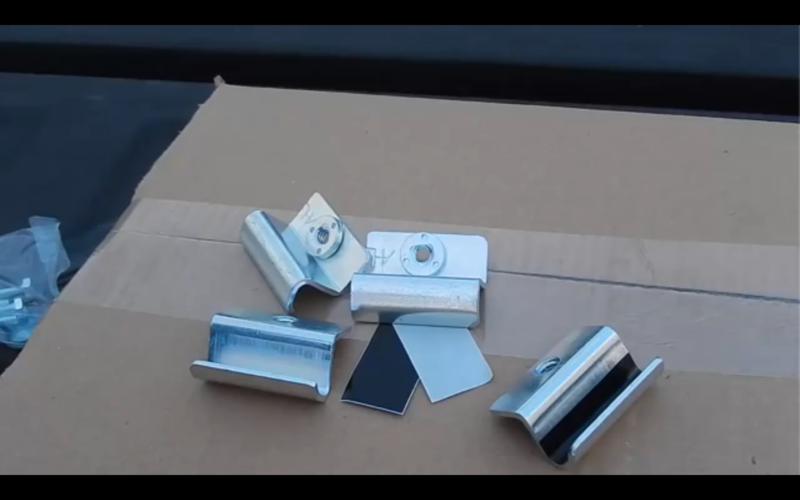 You can check out this video of how to properly mount one in your truck. Weather Guards really are industry-leading. The aluminum is thick and rugged, and both finishes – shiny black or shiny metallic – look great on any truck. Aluminum is naturally rust-resistant so it’s just for looks. The locking mechanism is very secure, and most thieves should see the Weather Guard logo and just move along. The weather strip keeps your tools bone dry and dirt free, they are known to last a lifetime. Plus, Weather Guard actually backs its products with a limited lifetime warranty, should you have any non-wear and tear related issues. They may be a bit more pricier than other models, but you’re paying for their exceptional quality. Next up on the list is this Low Profile model. Many people prefer getting a low profile style so that the vision out the back window is barely inhibited at all. This is the same crossover style, that spans the width of your truck bed, resting on the bed rails. It is meant to fit full size trucks, such as a Ford F150. The included tray is actually steel, not plastic like some other cheaper brands. It also includes the level holder to keep your glass level safe from bouncing around with your other tools. This version is made from the same high-quality, diamond plate aluminum as the other models on this list. Many other products on the market are thin an d easy to dent, but the walls are thick and durable. This Low Profile model also comes in two options for finishes. There is a clear-coated Armor-Tuf finish that maintains the classic shiny metallic look, or the Armor-Tuf shiny black powder coat finish. Aluminum is rust-resistant naturally so either finish doesn’t affect the longevity of the exterior. If you’ve modded out your truck with any plasti-dip or similar black accessories then the black finish may be better suited for you. But, any blemishes or scratches will be more noticeable, so keep that in mind. These storage containers are extremely secure. Their thick, sturdy aluminum walls and lid would be extremely difficult to pry open. The locks are very secure as well, well made and protected and would be very hard to pick. The automotive style rotary latches won’t bend and keep the lid closed tight. Another great feature is the steel cage surrounding the gas lifters – the small shocks that help open the lid up to 90 degrees – protecting them from bumps and damage. It will keep your tools nice and dry as well. While some folks find other cheaper brands will let in moisture especially in heavy weather, this one stands holds faithful. The rubber seal around the lid closes super tight locking out dust and water. 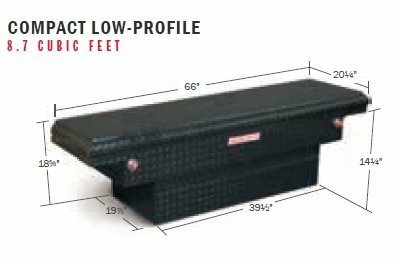 Because of the low profile, it is a full 3.5 inches shorter than the model we covered above, almost all of that distance reduced in the lid. So you are losing a small amount of storage space if you are really stacking your tools up. The entire thing measures 71.5 inches across, fitting full size trucks, with a height of 15 inches and depth of 21.25 inches. The depth is the same as the model above though so you still get a good amount of storage space. Installation is a breeze, and the same as the other models we covered, using their unique brackets rather than other simple weak J-hooks. When you really get down to it, it is almost an identical model to the first one we covered, but in a Low Profile style. You lose a small amount of storage space, but don’t lose any sight out your back window due to the thinner lid. It’s made with the same high-quality, thick aluminum with two options of finish: black or clear. The locks are secure, the lid is water-tight, and the trays keep your tools organized. Factor in the limited lifetime warranty, and you really can’t go wrong with this Low Profile container. If you read through the last two reviews and were disappointed by the fact that they only fit full size trucks, well this one is for you. This Low Profile model fits mid sized trucks, and although you lose a small amount of storage space due to the shape (although not as much as a wedge-shaped one) and you still are getting the same quality materials and manufacturing. 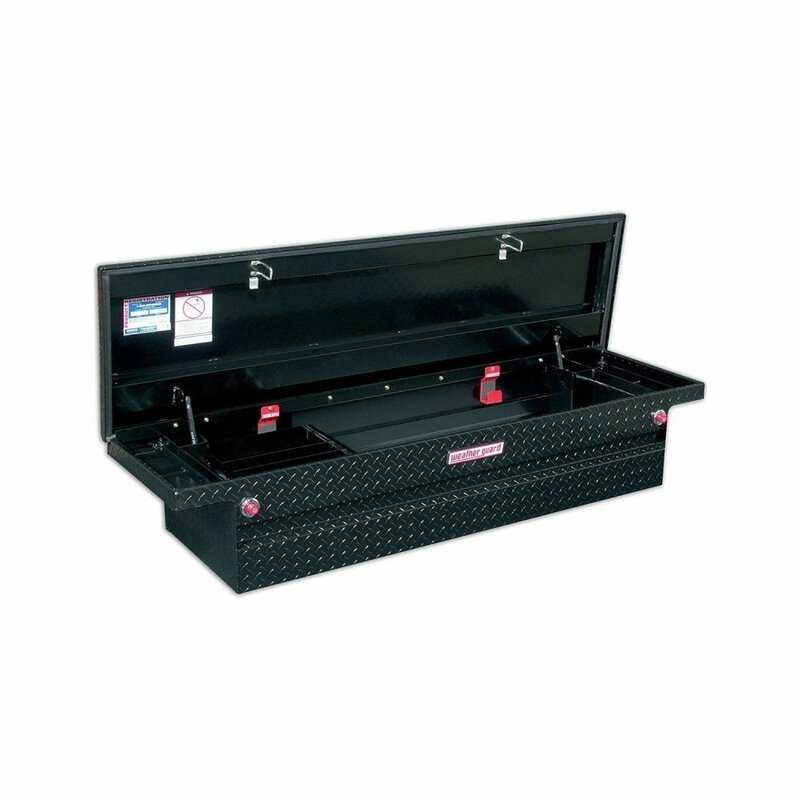 This crossover style, single lid model will keep your tools safe and sound in your mid sized truck. 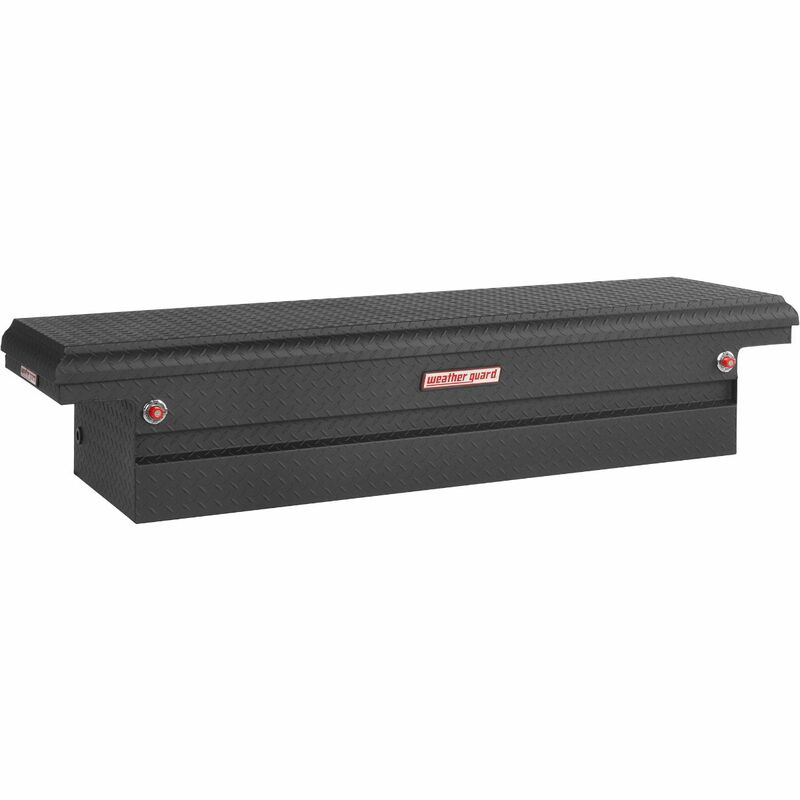 It spans the width of your truck bed, resting on the bed rails. The shape is to account for the position of wheel wells on most smaller trucks, or step-side trucks. A small metal tray is included to keep your smaller materials and tools organized and separate from the tub. The gas lifting shocks are protected by a steel housing as well, and the two sections that lie on your bed rails can be used as a storage compartment for small hardware. This model, like all WeatherGuard tool boxes, are made from the same, high-quality industrial grade aluminum it uses for all its products. The thick-walled diamond plate aluminum is sturdy and rugged, and won’t bend or dent easily. You can even stand on the lid without fear of bending, and the diamond plate design gives your boots traction. It also comes in the same two finishes, either black powder coated or clear coated aluminum. The finish is just aesthetic since aluminum is naturally rust-resistant. The retracting style locks are great for preventing theft. And, the thickness of the aluminum and ruggedness of the lid will withstand prying or cutting. Most thieves will likely see the WeatherGuard logo and just move along. Besides the security features, it is extremely weatherproof as well. If you’re going to be storing hundreds or thousands of dollars of gear and tools, you want to make sure that they are going to stay dry and rust-free. The rubber weather-proofing strip of the lid locks out moisture and dust particles keeping your tools clean and dry. 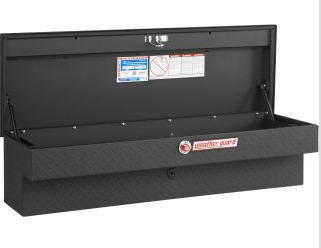 At 66-inches in length, this Weather Guard tool box is designed to fit mid-sized trucks. As such, it doesn’t have quite the same amount of storage as the other full sized models we’ve reviewed on this list. At only 18.5 inches of height, the low profile barely infringes on your view out the back window but depending on the height of your bed rails, the tub may hang down and touch the bed of your truck. 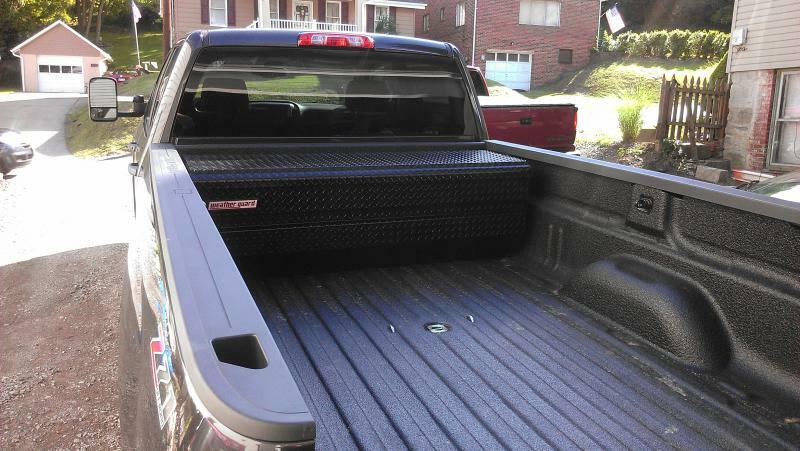 It has 20.25 inches of depth, so keep in mind your truck bed space may be reduced a significant amount. 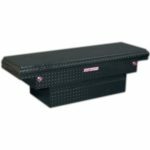 Installation is easy, using the provided hard ware to secure the it to your truck’s bed rails without any drilling required. If you need storage for your mid size truck (Tacoma, Ranger, etc.) then this crossover-style low profile is a great option. The aluminum is thick and rugged, and there is quite a bit of storage space even though it’s smaller than the full sized, 70 inch models. It is a bit pricier than other brands, but you get what you pay for. The locks are extremely secure with their retracting design, and the lid and tub are thick and sturdy and won’t be easy to pry. If you’re going to be storing expensive tools and equipment in there, it will be a worth investment – plus you get Weather Guard’s limited lifetime warranty. 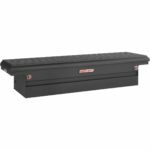 While the previous three WeatherGuard tool boxes have all been crossover, or saddle style, which span the width of your truck bed and rest on the bed rails, this one is a bit different. This is a chest style model. This type of actually sits directly inside the bed of your truck, rather than mounting to the bed rails. This type of storage solution has a unique set of benefits and drawbacks. 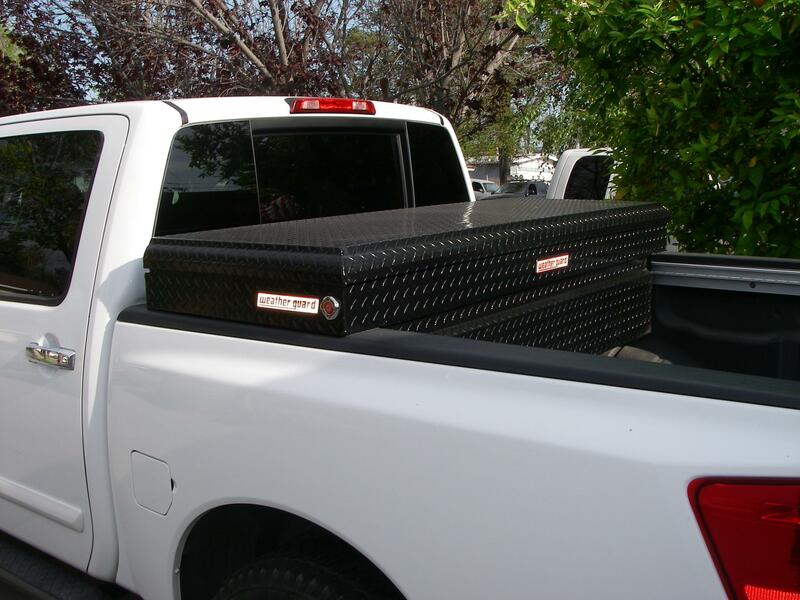 Depending on the height of your truck bed, you can use it in combination with a tonneau cover or canopy, which is a great asset for many folks. However, they will often require drilling in the bed of your truck for installation. But, if that doesn’t scare you away, they still are great storage solutions, and can be easily removed and used in your garage or other spaces for multi-purpose use. It also comes with the same metal tray to keep smaller gear all together and organized. WeatherGuard manufactures their chest models with the same care and quality as its other products. The aluminum is thick, strong and durable in a diamond plate design. The diamond plate adds strength and grip. The gas auto-lifting shocks that help open and keep the lid at 90 degrees when open are protected by a small steel housing. The automotive style latches keep the lid closed tight, and the lid is easy to open with just a single slight push once unlocked. It’s easier to find the black, Armor-Tuf powder coated finished versions for whatever reason. If you’re really set on a shiny metallic finish, can probably find one, but we think the black looks great so it’s just up to your taste. This Weather Guard features a retractable cylinder lock that keeps your tools locked up safely. The automotive latches keep the lid closed tight, and even if someone were to try pry it open, the thick walls and lid should stand up to the abuse keeping your tools safe. 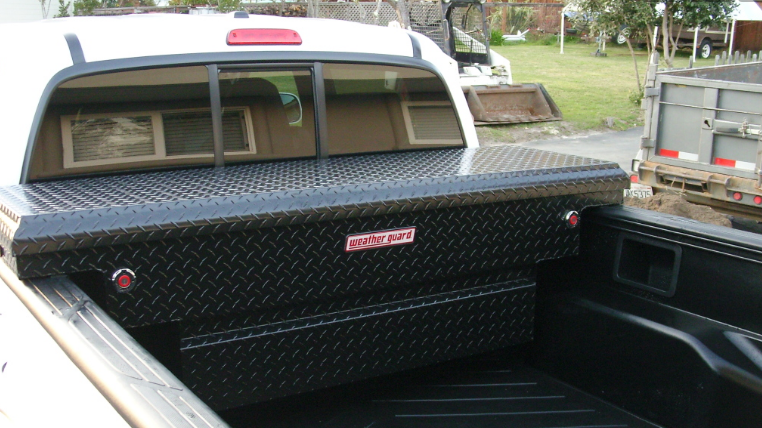 Using this box with a tonneau cover or canopy will also increase the security. The rubber weatherproofing strip will make sure your tools stay clean, dry and rust-free regardless of the weather your truck is facing. 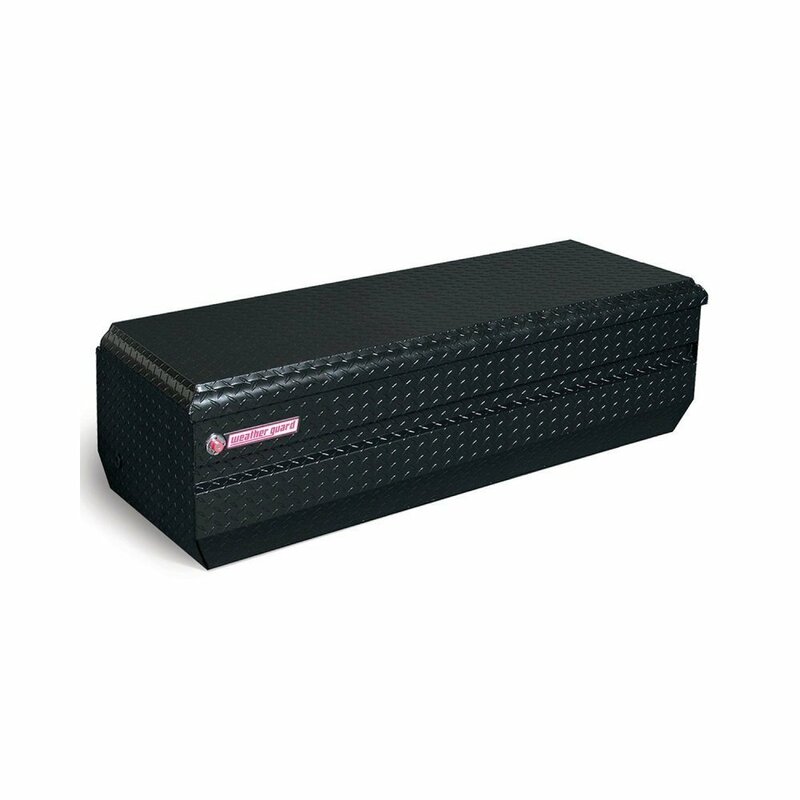 This WeatherGuard chest comes in two sizes, one fit for full size trucks, and one for mid sized trucks. The full size model measures 62 inches in length, so you’ll want to make sure your bed can accommodate it. 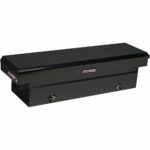 The chest is 19.25 inches high, so the height of your bed rails will determine whether or not you can use a tonneau cover or canopy with the it installed. 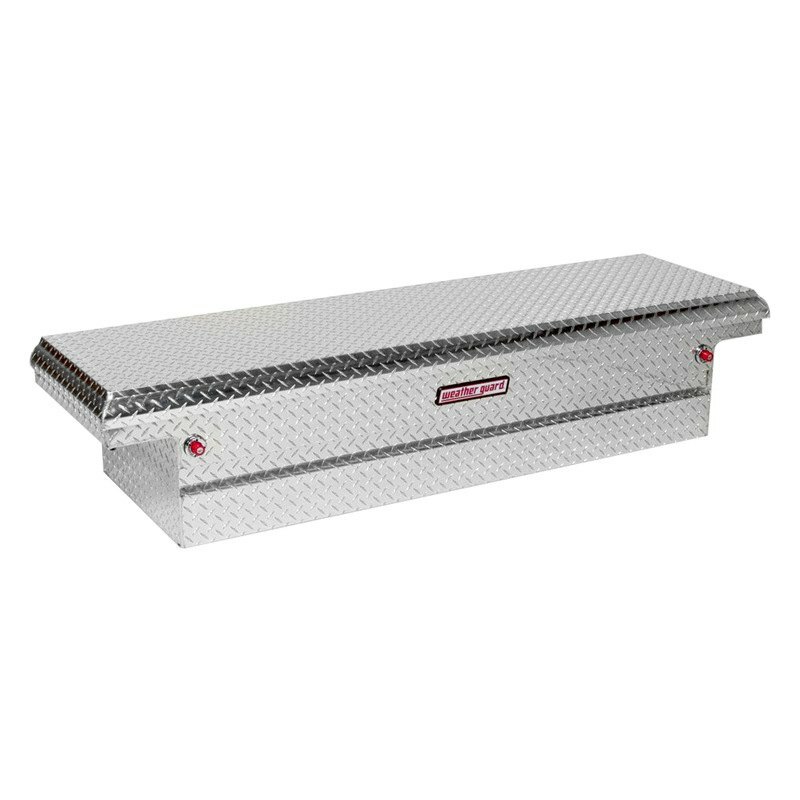 It has a depth of 27.5 inches, so keep in mind you will lose that much space of your truck bed, reducing your hauling capability. The smaller chest measures 47 inches in length, suitable for smaller mid size truck models. It has a height of 19.25 inches and 20.25 inches, and of course you could even use this storage solution with a full size truck if you wanted. 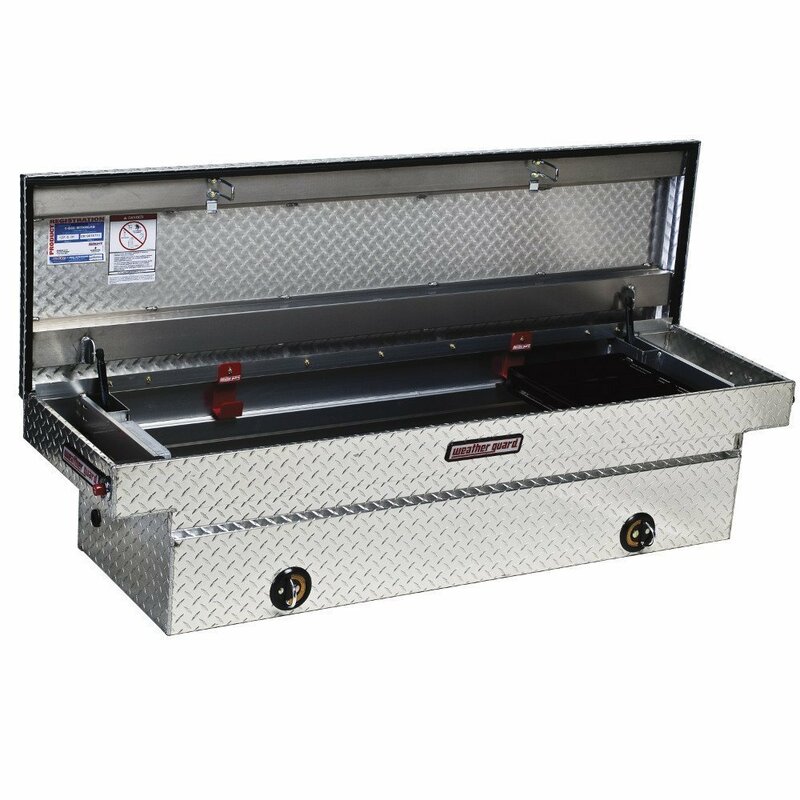 One of the major drawbacks to picking up a chest style Weather Guard tool box is that installation in your truck bed will require some drilling in the truck bed to safely and securely mount it, not nearly as easy to mount or remove as a crossover. You could also chain it up, but it could be susceptible to sliding around, or the chain could just be cut. Some folks prefer a chest for a few reasons. 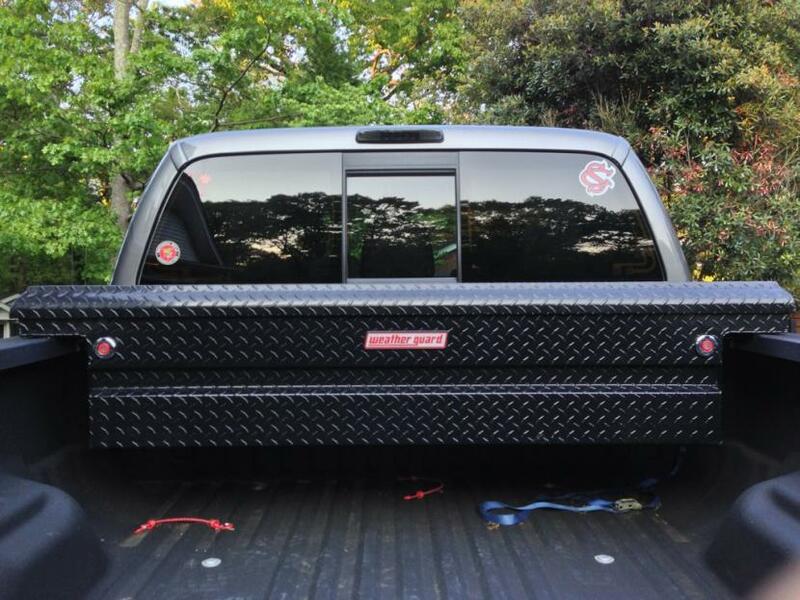 They can be used on and off your truck easily, and depending on the size of your truck and chest you buy, you can use them with tonneau covers or canopies since your bed rails are left open. There is a full sized and mid sized model of this WeatherGuard tool box available, so whatever you drive you can find one that fits. The same industrial grade, thick aluminum is used providing strength and durability. The lock is tamper-resistant and it is weatherproof and backed by Weather Guard’s limited lifetime warranty. 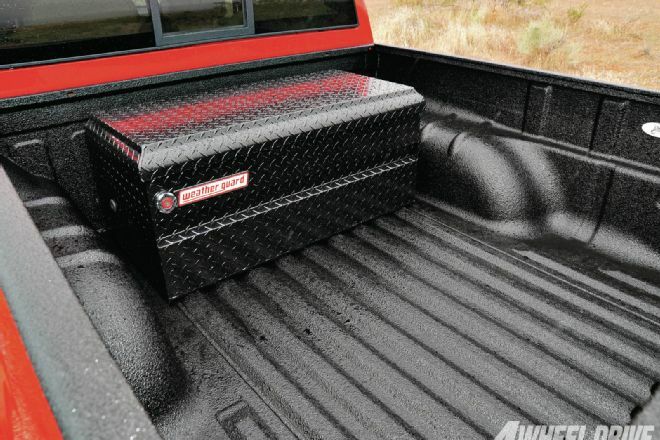 If you think a chest fits your needs, this one would be a great addition to your truck. 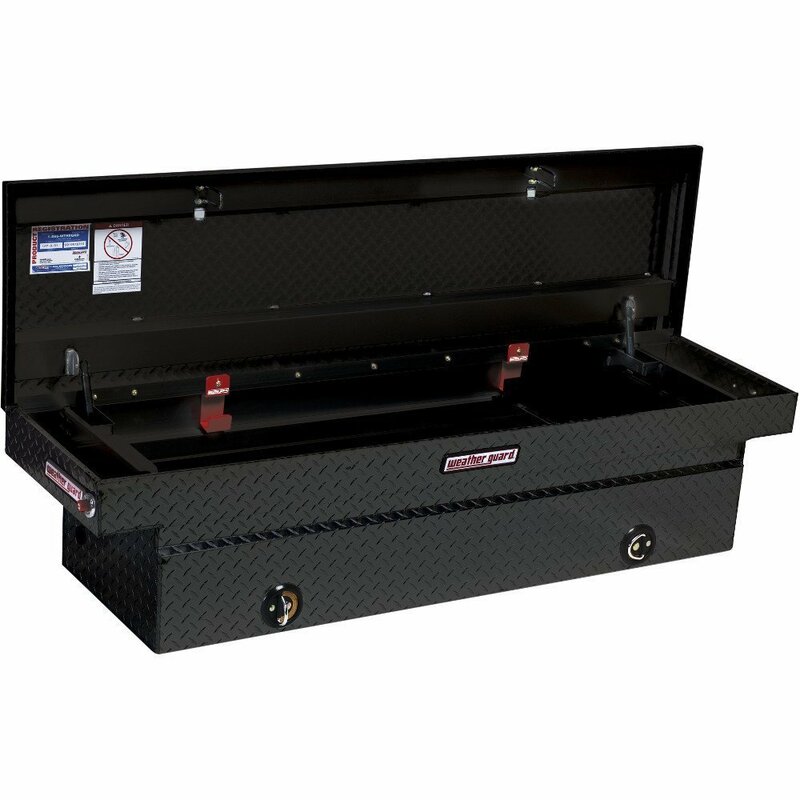 Last on our list for WeatherGuard tool boxes is their 47-inch side-mounted model. 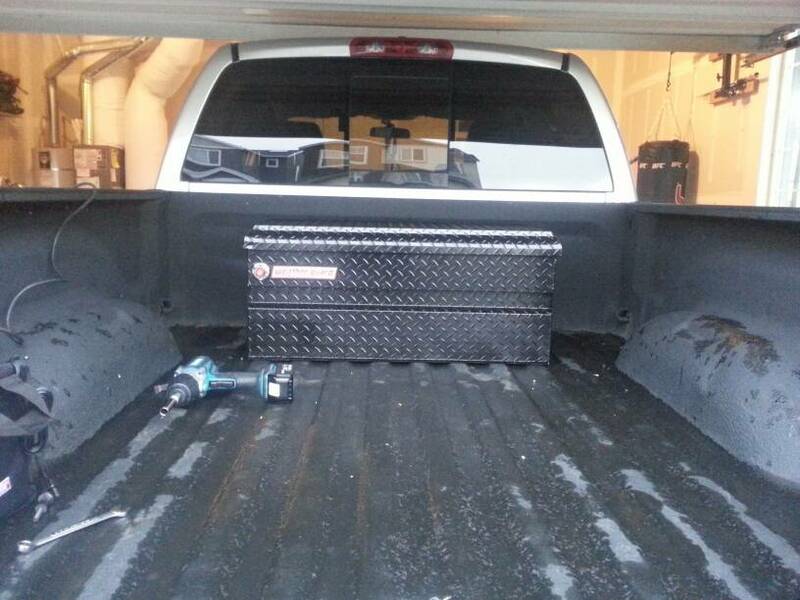 Side mounts are a great way to add storage to your truck. They sit on both the wheel well of your truck and the bed rail. Side mounts are great for providing easy access to your tools. Since you don’t need to hop into the back of your truck, you can just get at your tools easily from the side. They’re not as large as a crossover style, so keep that in mind, but they are very versatile. Many folks like those in trades will actually get two side mounts in combination with a crossover for maximum storage. You can mix and match your tool boxes to your needs. Again for whatever reason, it seems easier to find the black Armor-Tuf powder coated version of these, but they do also come in shiny metallic clear coated as well. Either way, WeatherGuard manufactures these with high quality sturdy a nd rugged aluminum. Some more affordable brands have thinner aluminum that may bend or dent easily, but the thick walls and lid should stand up to a substantial amount of abuse. The auto-lifting gas shocks help easily lift the lid to 90 degrees, and they’re protected by a small steel housing. It comes with WeatherGuard’s tamper-resistant locking mechanism to keep your tools safe from theft. The lock actually retracts when locked, so its hard to get at our pry out. It would also be quite difficult to pick the lock. The automotive style latches make the lid close tight, and combined with the thick aluminum construction of the lid make it incredibly difficult to pry open. 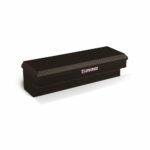 The lid also features a rubber weather-tight seal, so your tools will certainly stay dry and clean since the the lid seals tight locking out dust and moisture. Due to the size, it is designed for use with a full size truck. However, it could be made universal as well, capable of fitting mid sized trucks – though depending on the exact specifications of your truck bed and wheel wells, you may need to shim it with some wood, plastic or metal to make sure it sits flush. That being said, the actual measurements are: 47.25 inches long, 13.25 inches high, and 16.25 inches wide. 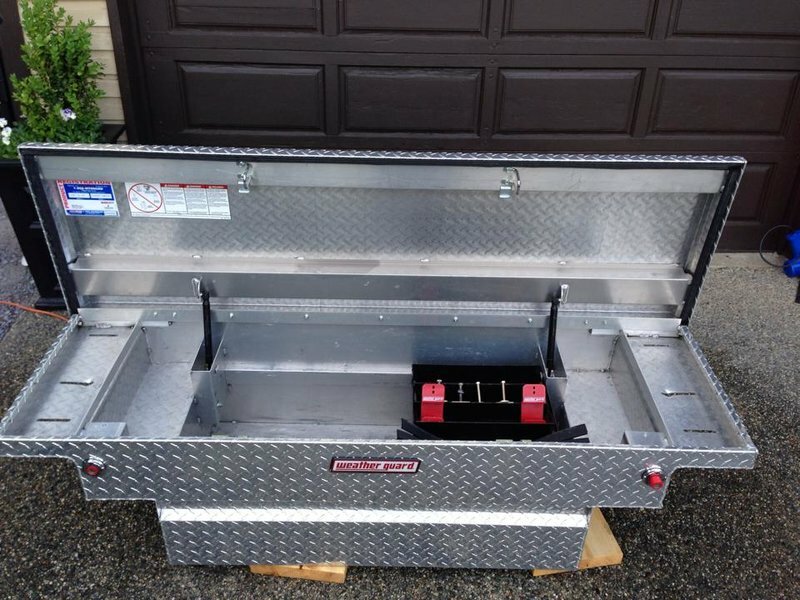 You’ll want to make sure that it will fit in your truck bed without too much modification. Installation is the same as all WeatherGuard tool boxes, using their unique J-bolt bracket hardware providing a secure fastening. 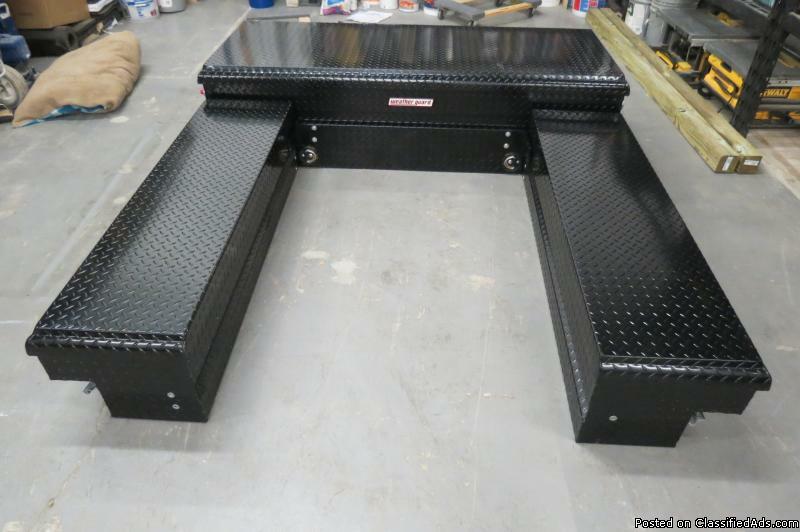 But, there are also two legs included that can be bolted to the truck bed, which will require drilling in your bed. You can avoid drilling in the bed by just mounting the legs to the toolbox, and have them sit loose in the bed, or you may not even need them depending on the size of your wheel well. We definitely recommend using the legs if you’re going to be storing a lot of gear and heavy tools in there though. Side mounted models are great for adding extra storage in combination with a crossover model, or just having an easier access storage space for your truck. You don’t have to hop into the back of your truck to reach your tools, and can just reach over the side of your truck. This WeatherGuard is built with quality, rugged diamond plate aluminum and features a tamper-resistant retractable lock to keep your tools safe from anyone trying to get away with your tools. It is weatherproof so you can rest easy knowing your tools are going to stay clean and dry, important for when you’re storing expensive tools and gear in there. You can get away with not drilling your truck bed when mounting the support legs, though we do recommend it. 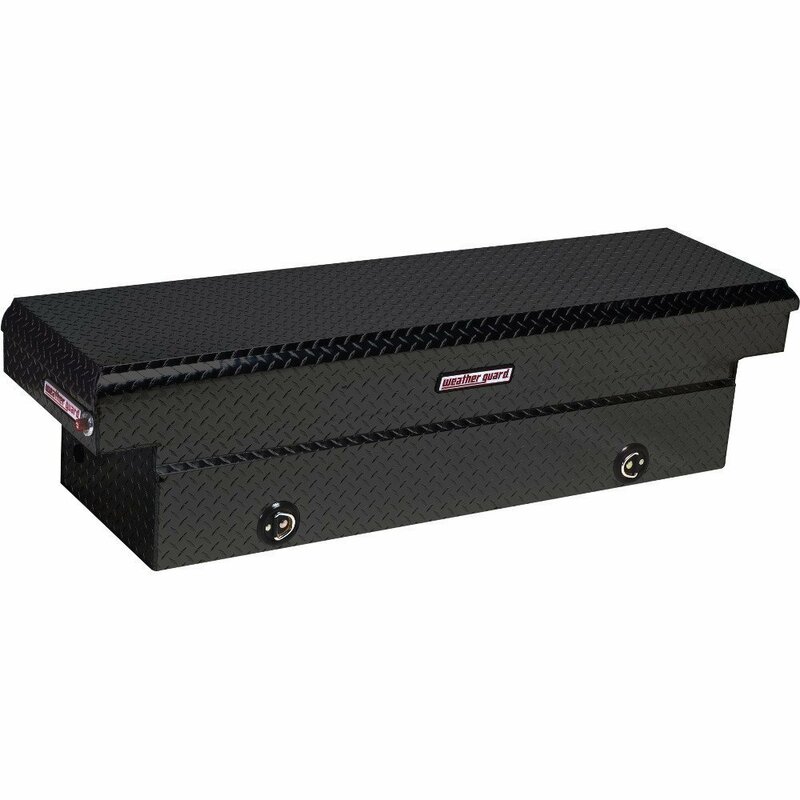 Overall this is an awesome side mount tool box, and although you’re paying more than other cheaper brands, you’re getting Weather Guard’s superior quality and their limited lifetime warranty. Did this article help you choose a WeatherGuard for your truck? Let us know your questions or concerns in the comments below, we love hearing from our readers!